RADFORD, VA, OCTOBER 15, 2012 – Thanks to her latest book, Peering Through the Veil: The Step by Step Guide to Meditation and Inner Peace, Radford resident, Debbie “Takara” Shelor, is now an Amazon bestselling author. After graduating from Virginia Tech in 1987 with a degree in Industrial Engineering, she headed off into the business world and the climb up the corporate ladder. Her career success was won at a high price. The more success she achieved, the higher her stress level became. Eventually she hit the wall. Realizing that stress was literally killing her, she decided her life needed to head in an entirely new direction. She left the corporate world, moved to an island, and co-founded a non-profit for dolphins and whales. And that was just the beginning. In Peering Through the Veil, she takes the reader along on her 18-year exploration of meditation, inner peace, world travel, and spirituality. In addition to practicing numerous forms of meditation from many traditions, she traveled extensively throughout North America, lived in Santa Fe, New Mexico for over 9 years, and also aboard a million-dollar yacht in the South Pacific for awhile. 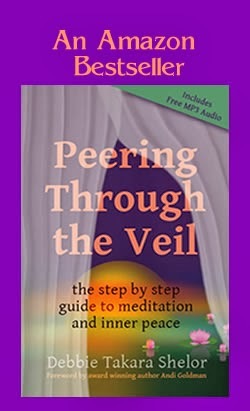 Readers of Peering Through the Veil have the opportunity to discover a myriad of meditation methods including: transcendental meditation made popular by The Beetles, Native American sweat lodge, the latest scientifically proven brainwave technologies, and many more. In addition to the various meditation forms, Takara explains ways to get the most benefit out of each meditation experience and how to not only achieve tranquility, inner peace, lower blood pressure, and improved health, but how to find joy and an endless spring of creative inspiration and insight as well. The book was officially launched on August 24th and the following day reached #2 in its category on Amazon. Visit http://www.PeeringThroughTheVeil.com for details and to purchase. I Crashed and Burned So You Don't Have To! Stop Your Stress Before It Kills You! "How do you thank someone who comes into your life and because of her influence your life is changed forever? Takara has graced my life with her many talents and skills. Especially through her healing arts, I have made quantum leaps forward in my life. At one crisis point she was able to facilitate my integration of a significant shift in only 10 minutes! Her knowledge, and keen ability to share it, have enriched my life forever! Perhaps due to her engineering and teaching background, she has an amazing ability to take extremely complex concepts and information and boil it down to bottom line usefulness with clarity. She makes things implicitly simple and understandable to a lay person. Her extensive studies in metaphysical and philosophical areas allow her to create freeways for those of us who don't have time to sift it all out. The clarity she creates with her accelerated techniques allows you to quickly come on-line with the information, to transition, and to push past limitations." Copyright (c) 2012-Present Forchianna L.L.C. Powered by Blogger.